Barrel Organs, Mechanical Organs, Street Organs, Fairground Organs, Mechanical Musical Instruments. Order Code :BO1. £ P.O.A. 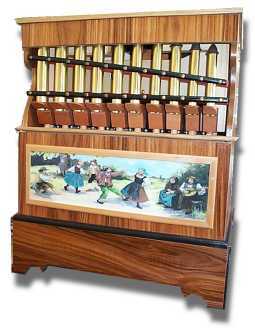 This small pipe organ plays a 20 note paper roll scale and contains 20 pipes and is Hand Cranked, operated on bellows; simply insert a roll and turn the handle to play. Each roll usually has between 3 to 5 tunes and you can purchase extra rolls to enable an almost endless library of different music. 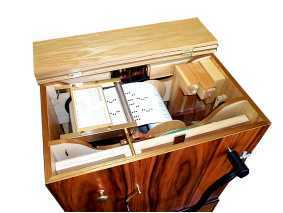 The veneered case has the brass piccolo pipes on show with a traditional print picture below. Extra 20 note Music Rolls £ P.O.A.